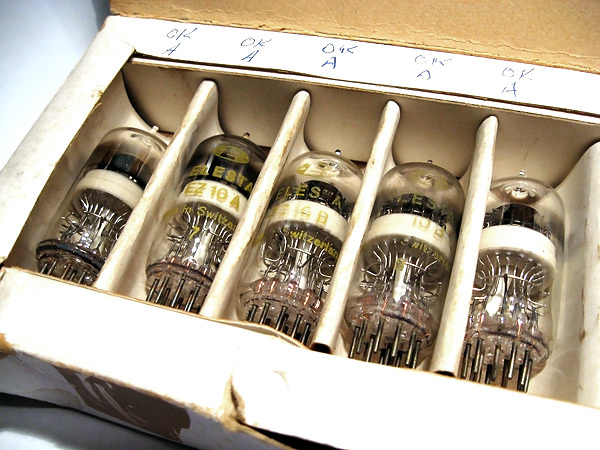 One of the most unusual counting tubes ever made, the EZ10A and EZ10B are unidirectional bent-cathode selectors in a miniature envelope. 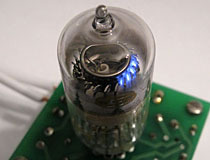 The EZ10A/B have a thirteen pin base, with three center pins surrounded by a ring of ten pins for each of the cathodes. 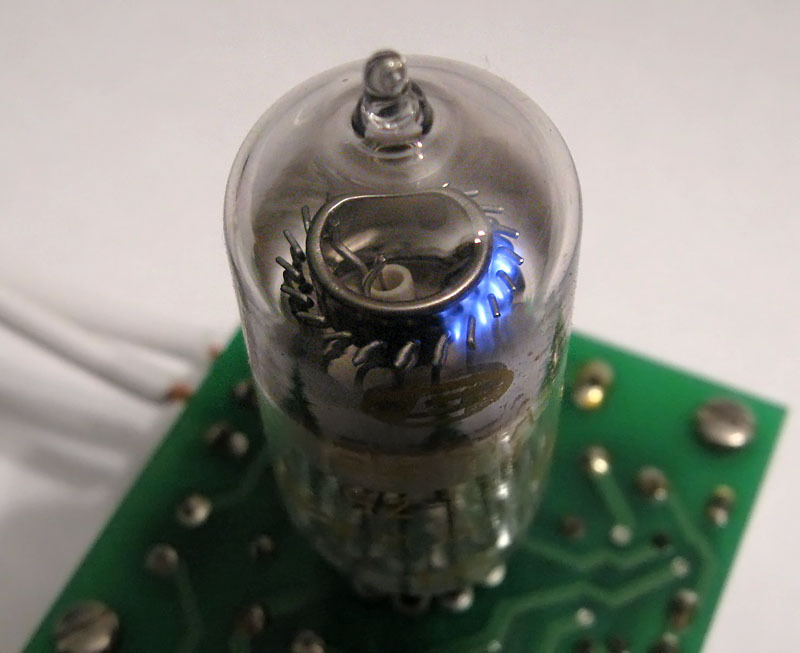 The EZ10A appears to be an argon filled tube and has a rated counting speed of 300 kHz, while the EZ10B is filled with hydrogen, and is rated at 1 MHz. Both the EZ-10A and EZ-10B are single guide selectors with only 20 cathodes in their counting loops. The guide pins are split out and brought to two separate pins, with one pin for the guides on the left side of the tube and the other pin for those on the right. This makes it possible to use the EZ-10A and EZ-10B as both a base-5 and base-10 selector. Even though the EZ10A and EZ10B have identical pinouts, they are not interchangeable, the higher voltage required for the EZ10B will actually damage an EZ10A if it is used as a drop-in replacement. 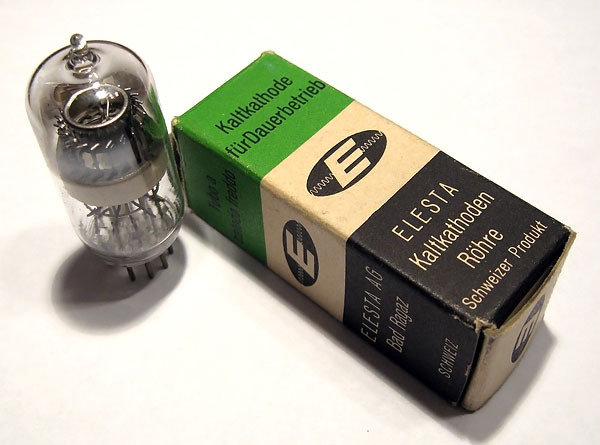 It is of special note that the EZ10B is a very late model of dekatron, the tube was not put into general mass production until 1961. 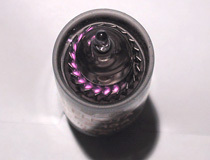 EZ10B's are also horribly failure prone... hydrogen gas is a notorious cage-breaker, and can ooze through the glass envelope even when the tube is in storage. 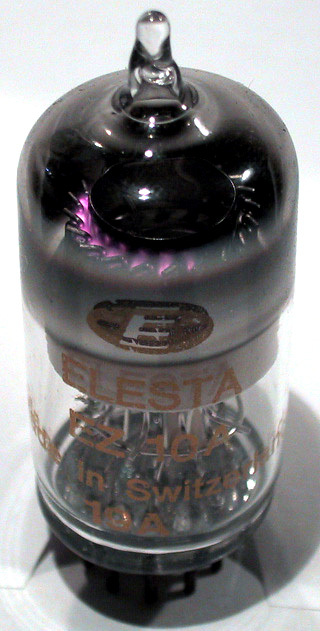 Elesta EZ10B dekatron, shown in normal operation. This side-by-side comparison shows the different discharge color of the argon filled EZ10A, and the hydrogen filled EZ10B. 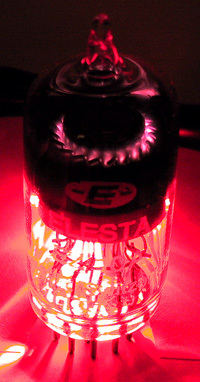 Elesta tubes were typically sold in 10-piece bulk packs for industrial use. Inside, each tube is cradled in a cardboard holder. EZ10A and EZ10B tubes were also sold individually in conventional single tube retail packaging. Miniature dekatron size comparision. 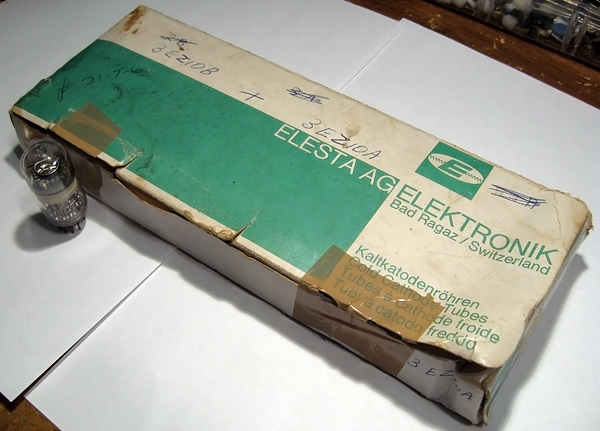 Part numbers from left to right:Elesta EZ10A, Westinghouse 6879, Sylvania 7155, Elesta ECT100, Soviet A108, Soviet A109. Elesta EZ-10A, wondering if dubstep is still a thing.